Gary Graff of Billboard.com reports that Kiss opened the U.S. portion of its Kiss Alive 35 tour by recreating its breakthrough “Alive!” album in the place it was made — Cobo Arena in Detroit Rock City. As its done throughout the year, the group dedicated its main set on Friday to 1975’s gold “Alive!,” playing all but two of the set’s 16 songs (“Firehouse” and “Rock Bottom” were excerpted) and altering the running order slightly to close with “Rock and Roll All Nite.” “Deuce” started the two-hour and 20-minute show amidst booming pyrotechnics, and the set list treated members of the Kiss Army, who packed Cobo to the roof for opening night, to deep cuts such as “Got to Choose,” “Nothin’ to Lose,” “Parasite” and “Watchin’ You,” as well as drum and guitar solos by Eric Singer and Tommy Thayer, respectively, and an extended version of “100,000 Years” that culminated in a call-and-response between Paul Stanley and the crowd. The encore dipped into post-“Alive!” Kiss favorites such as “Shout It Out Loud,” a rendition of “Lick it Up” that included a bit of the Who’s “Won’t Get Fooled Again” and “I Love it Loud” with a blood-spewing Simmons hoisted above the lighting rig. Kiss delivered the first public performance of “Modern Day Delilah,” the first single from the new “Sonic Boom” album that comes out Oct. 6 (the group shot a video for the song on Thursday at Cobo) before Stanley “flew” over the crowd to sing “Love Gun” on a satellite stage by the sound board and came back to finish with, appropriately, “Detroit Rock City,” with Kid Rock looking on and acknowledged by Stanley. A full camera crew documented the opening night concert as well as a second Cobo show on Saturday for what Simmons said would be an eventual concert DVD. The Kiss Alive 35 show has stayed largely the same throughout the year, but Stanley said some changes may occur once “Sonic Boom” — a Wal-Mart exclusive that includes a second disc of re-recorded Kiss hits and a DVD — is available. 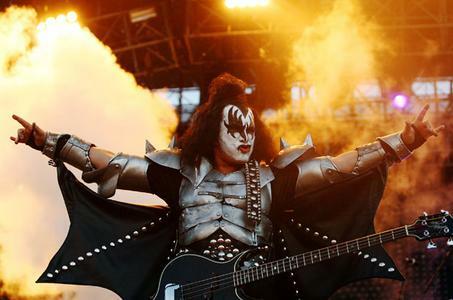 “It’s been basically a celebration of the 35th anniversary of (Kiss’ first album), but it’s going to morph into ‘Sonic Boom’ quite quickly as the album comes out,” he explained. Kiss, with opening act Buckcherry, will be on the road through Dec. 6, including more dates in Canada, where the group also toured during the summer, and a Halloween night show at the Voodoo Experience festival in New Orleans. The A&E network will begin airing “Kissteria,” a documentary from the group’s Australia and New Zealand leg of the tour, later this fall.